In all my adult life I have never roasted pumpkin seeds. And to be honest, I don’t know if I have ever actually eaten a roasted pumpkin seed on its own. I decided to change that. 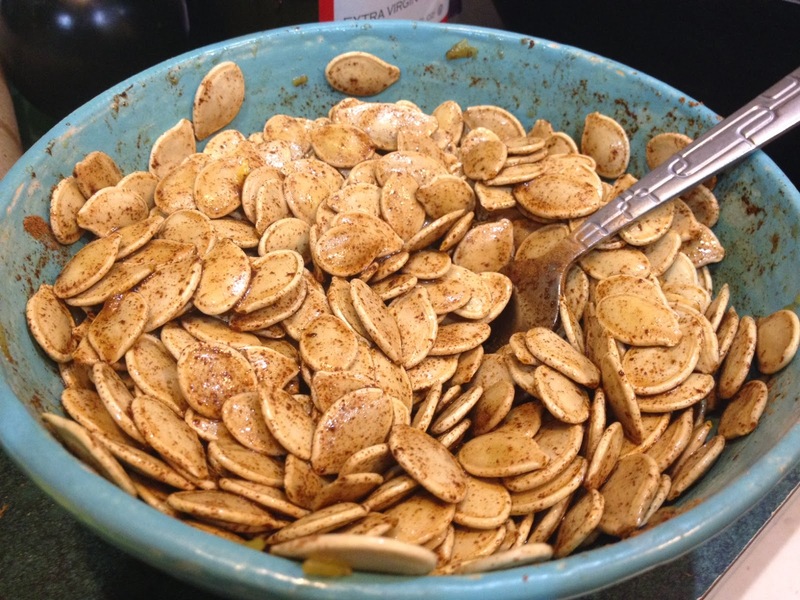 I read somewhere that pumpkin seeds are a natural antidepressant, who knows if that’s true, but they are definitely a great source of iron (among many other things). Over the weekend we carved our pumpkins (pictures to follow- I forgot to buy candles!) and these babies were BIG. 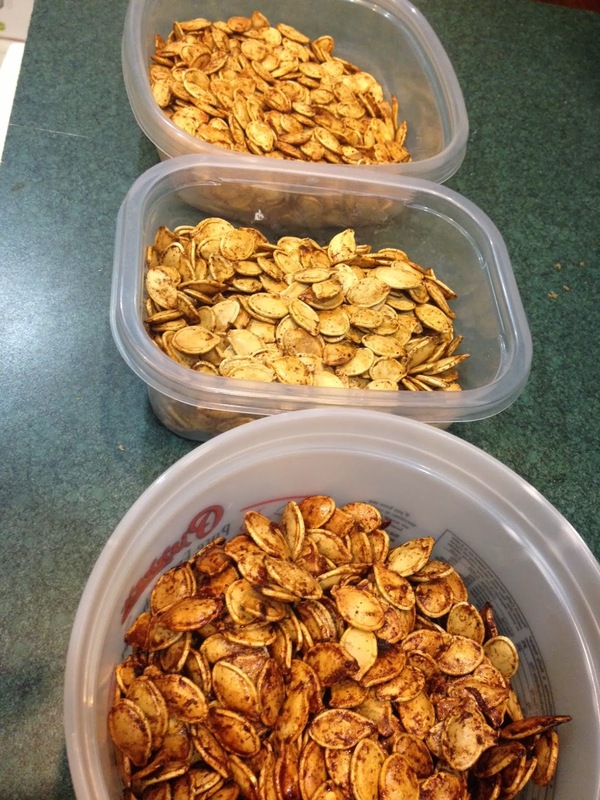 After spending what felt like hours sorting through the pumpkin innards I walked away with over 6 cups of nothing but seeds- crazy! After checking the internet for a basic outline of how to roast seeds (temperature, time, etc.) I was ready to dive in. Given that there were so many seeds I knew I wanted to make a few different batches, I settled on some classic categories: salty, sweet, & spicy. I preheated the oven to about 325 degrees and sorted my (already washed!) seeds into 2 cup batches. A few of the recipes I came across suggesting soaking the seeds in salt water to make them easier to eat/digest/something like that but honestly I was just too lazy to do that so I didn’t (maybe I should have?). 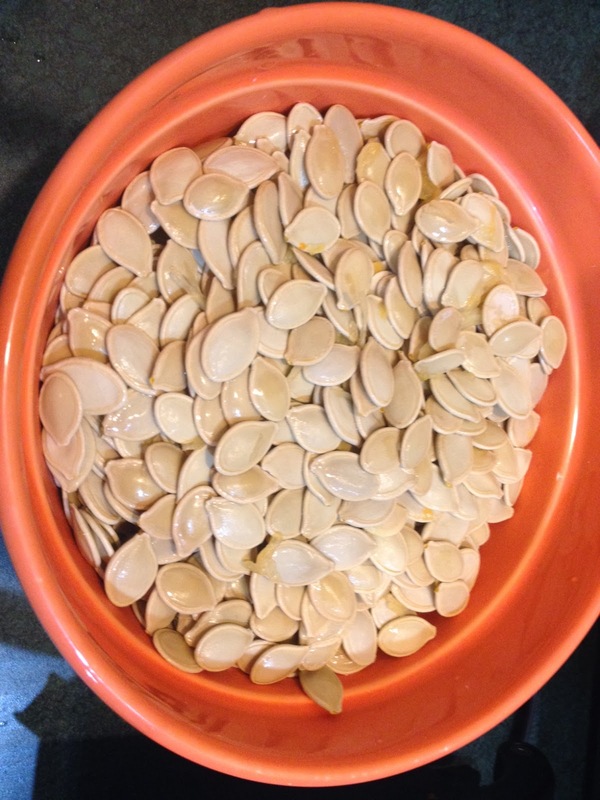 For each batch I added all the ingredients into the bowls of seeds and tossed well to coat. I then spread the seeds into a thin layer on a cookie sheet and baked them for 30-40 minutes, stirring frequently. The sweet were DEFINITELY my favorite. The spicy were good, but they were my very first batch and I think I could have been more heavy handed with the seasoning. Keeping that in mind I added a lot more to the salty and I was pleased with those as well. Overall I’m very pleased with my first attempt at pumpkin seed roasting- I just don’t really know what we are going to do with SIX cups of seeds! I already plan to add the sweet into some granola/yogurt, but any suggestions for the savory? I know I didn’t make it a secret that going into this race I was NERVOUS. I revised my goals many times and per the suggestion of all focused on just finishing, but in my heart I knew that I had one other big goal: running the entire thing. No walking, no stopping, no excuses. That kind of became my mantra. With a few delays along our way we made it (close) to the starting line. K. dropped us off and shouted a few motivational phrases at me as he drove away. KT & I tried to find our way to the corrals. The starting area was pretty hectic and honestly kind of poorly marked. Although there seemed to be volunteers everywhere no one was particularly helpful at the time. KT had a bag to check but there was very little indicating where we were supposed to do that so we just followed everyone else carrying bags. We finally found the gear check, dropped her bag off and got in line for the porta-a-potties. It was getting pretty close to 7a (when corrals supposedly closed) so we rushed through, said our goodbyes and good lucks and found our respective corrals. 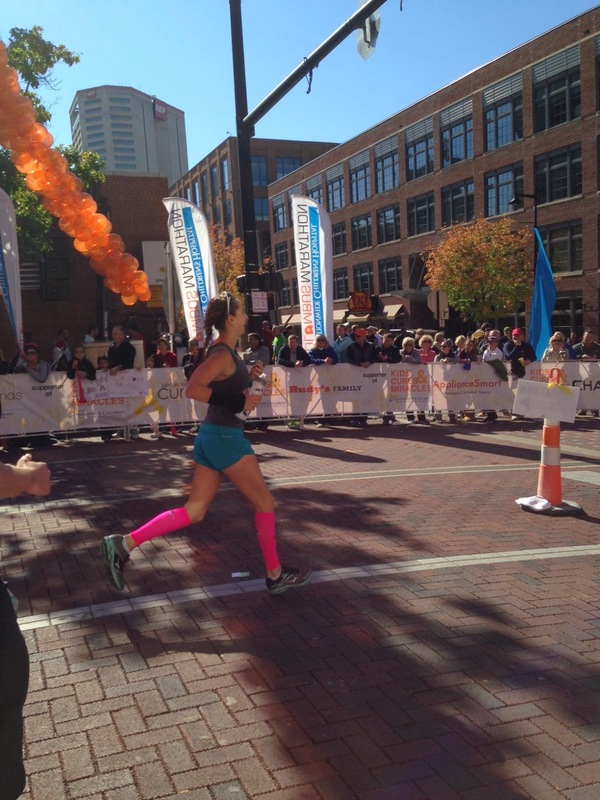 The Columbus Marathon went from 6 corrals last year to 4 this year and I’m not sure why. I found my corral to be WAY overcrowded and very hard to get into- there was one small entrance (so that bibs could be monitored) and the back up to get in was crazy! Tons of people were just jumping the fences and bypassing the bib checkers which was frustrating to me, a follower of rules, but I just blocked it out and tried to get into my own zone. I had a weird sense of calm washing over me. I’m generally almost afraid to be confident, I’m more the kind of person who lowers expectations so as to avoid disappointment, but I was feeling really good and that was terrifying. I knew that today was my day and I really tried to go with that feeling. Despite the freezing temperatures and lack of personal space, the 30 minute wait between corral close + first corral release flew by. I ditched my sweats and my windbreaker, popped a Shot Blok in my mouth and got ready to run. As corral B moved up to the start line I soaked it all in: I was going to run a marathon! I was very focused on keeping my first miles in check, I refused to go out too fast and ruin my race (as I have done during every.single.half-marathon) so my key phrase was “hold back”. Despite the crowds I had quickly settled into a pace that I knew was too fast, so I just kept repeating “hold back” and finally found a happy place around 10:30. My goal was to keep my miles between 10:00-11:30, slow but steady. The first few miles honestly flew by, I knew I’d be seeing K. just past mile 1 so that was my first little burst of energy. I kept my eyes out for him, which was good because I think he would have missed me if I didn’t start screaming his name! After I saw him I turned up my music and just stayed focused on slowing my pace down and enjoying my surroundings, as I knew I wouldn’t see my cheering crew again for another 7 or so miles. Per the suggestion of Carolina John, I was taking a small sip of water during every song change (which ended up being the perfect hydration strategy!) and then sticking with my tried-and-tested nutrition of one Shot Blok every three miles. That little routine made the whole marathon seem more manageable- it basically broke the race up into little three mile sections for me. Although I still felt very strong and comfortable it was around mile 3 that I realized two things: 1. these shoes are dead. They may have JUST died. Either way I’m never wearing them again and 2. I am pretty sure I have some level of a stress fracture in my foot. I hadn’t really had many doubts, I still felt strong and great, but the thought of an actual injury ironically made me commit even more to my goal of running the entire thing- because I imagined I may be sidelined for a bit post-race I might as well make it worth it, right? I had told my family to expect for me to hit that halfway point just around 2:20:00 and I knew that I was doing a good job of staying on track for that. I kept my eyes out for my cheering section around mile 8 but I nearly missed them! A big thanks to the non-headphone wearing runner next to me who got my attention :-). I told K. I didn’t need more fuel, said my goodbyes and continued on. I didn’t expect to see anyone again until mile 20ish, so I knew that I had to make sure I was keeping the positive thoughts going strong. As I was running through mile 9 I thought about how terrible I felt at that point during the Columbus half last year and even Cap City back in May- I had started walking there in both races- but not today. Today I felt SO STRONG, which was extra great considering I still had 17 miles to go, haha. The next few miles were pretty uneventful. They felt easy and I was just preparing myself to get through the low of watching all the half marathoners turn toward the finish line. 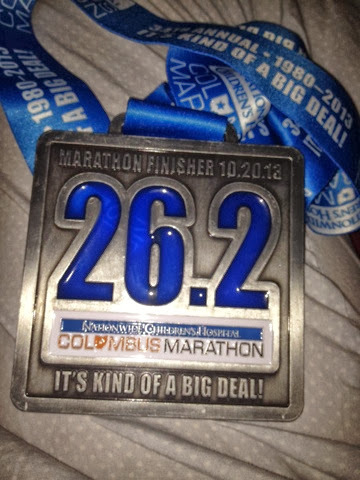 An important part of the Columbus Marathon is that it supports Nationwide Children’s Hospital. Each mile is dedicated towards a current or former patient and throughout the mile you see facts and photos of the patients and, for those who are well enough to be there, you see the patient themselves. Which is certainly motivational. Mile 12 is the Angel Mile, dedicated to the kids who lost their battles. Last year at that point I was in the homestretch and pretty much only thinking about collapsing but this year I was trying to hold back (all the half marathoners were picking up their paces at this point) so I had a chance to really have a moment for those children. I got to see their friends and family members holding signs dedicated to them and it was very touching. As I hit mile 13 (and watched hundreds of happy half marathoners finish up their races) I felt exhilarated- I was doing this. I was running a marathon and there was no turning back! I knew what was coming next- a very desolate stretch. This race is notorious for a serious drop in spectators from about mile 13-18. To make matters worse I wasn’t expecting to see K. again until somewhere near mile 20. And on top of all that, we had a slow gradual incline to run up for at least 3 miles. It was not a good time. Despite all of that- I felt strong and confident. I just kept saying “wow, you are really going to do this!”. I was easily maintaining my hydration + nutrition strategies and I felt perfectly fueled- not sloshy or thirsty, not hungry or sugar-highed- just perfect. I already started telling myself how this was my smartest race and how I had nailed nutrition. I didn’t want to get TOO cocky at this point- I was still fearing the dreaded wall- but I really tried to keep all negative thoughts out of my head. As I was strolling along High street and enjoying my race PDR I was extremely shocked to see K. (conveniently standing right in front of my work) yelling for me! I took out my headphones and I just screamed back “I haven’t walked yet! I haven’t walked yet!”. I told him I was good on fuel and I’d see him again at 20. That was such a pleasant surprise! As the course took a turn onto Lane avenue I was relieved because I knew we had a bit of a downhill in front of us. I started having new landmarks in my mind: 16.3 miles because less than double-digits left, 17 miles because that was my longest continuous run prior to this, 20 miles to make up for my failed 20-miler/see K., 23.1 miles because only a 5K left. Little things like that were pulling me through. At around 17/18 we went into the famed Ohio State Stadium (the ‘shoe) and while I’m sure other people found this super exciting, I found it kind of dumb. We had to run down a sudden, steep downhill (really hard after 17.5 miles of running), take ~20 steps in the actual stadium and then a sudden, steep uphill! It felt like a cruel joke. What I DID like about this part was that it was a turnaround, so I had seen the people in front of me and now I was seeing the ones behind. During the entire race I NEVER looked back (because why would I?) 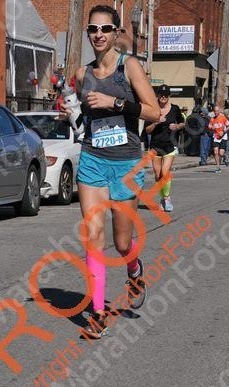 and kind of had it in my head that no one was running as “slow” as me- which is crazy, I realize. But I somehow found comfort in knowing there were thousands of people in every direction. After the stadium the next 2 miles felt like a mountain- and looking at my Garmin data it was the highest climb of the entire race, which is just mean! I’m proud to say that mile 19 was the first time my pace crept over 11 minutes (and a bit sadder to say that it would never go back down- whoops!). These miles were a bit less rosy- my back and my hips were starting to hurt- but I truly feel like I never really hit “the wall”. I definitely slowed a bit, but I still felt strong and almost more confident than ever. As soon as I hit mile 20 I knew that I only had a measly little 10K left and I had redeemed myself from my failed training run. Shortly past 20 I saw K. again and I started screaming “NO WALKING! I’M DOING THIS!!!! !” kind of like a maniac, pretty sure I freaked out the runners around me, but I was just so excited! Any remaining fears I had were completely gone- there was no doubt in my mind that I would finish this without walking. Mile 20 through 23 were again, uneventful, I was just so ready to get to the final 5K. I actually saw the 4:30 pace group around 20 or 21 (they had started a corral behind me, so it was probably more like 4:35-4:38 for me) and thought about booking it and finishing with them but the not-so-great pain in my foot told me that was a bad idea. I once again made peace with the fact that this wasn’t a time goal race for me and I just kept doing my own thing. At mile 23 we were greeted with a Kroger sponsored food stop, full of cookies, candy, fruit and soda. I ate my last planned Shot Blok @ 21 so an orange wedge sounded perfect to get me through these last few miles. It tasted like heaven, really. When I hit mile 25 I started welling up for the first time, I knew only one more mile marker stood between me and finishing this thing. By this point I had turned off shuffle on my iPod and started putting on my power songs (“Roar” by Katy Perry, “Can’t Hold Us” by Macklemore & Ryan Lewis and “Dog Days Are Over” by Florence + the Machines) over and over. The crowds got REALLY thick right near the “1/2 mile to go!” sign and it was all so overwhelming. I had the BIGGEST smile on my face but I was also basically crying. 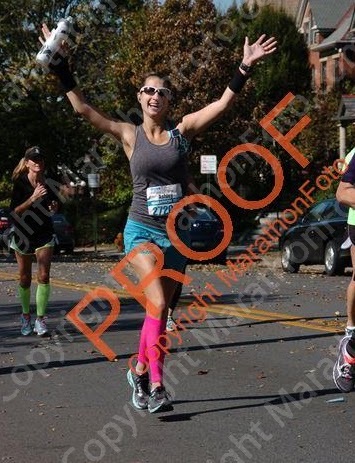 As we took a turn toward the finish line I was just completely in awe- of the people cheering for me, of the people in front of and behind me, and of myself. I ripped my headphones out of my ears and ran as fast as I could towards the finish line. After 26 miles of running I felt like I was flying but after watching the video that was not quite the case, haha, but either way. 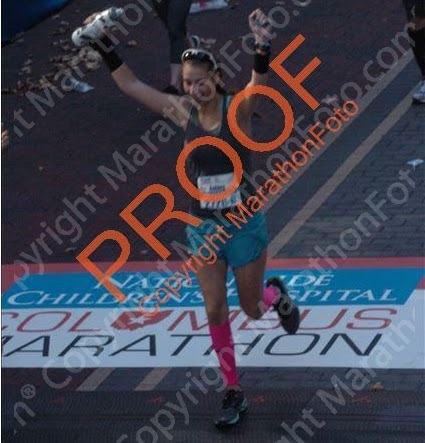 I gave it everything I had left and crossed the finish line with my hands in the air. I had actually done it. I thanked every volunteer who would listen and proudly posed for a finish line photo (something I’ve skipped in other races). The second I stopped running I was acutely aware of all the aches and pains in my lower legs but at that point it really didn’t matter. The first thing I said to K. when I finally got to hug him was: “I ran the whole thing. I didn’t really I think I could do that, but you did. And I did it!”. I can say without a doubt this was the smartest race I’ve ever run. 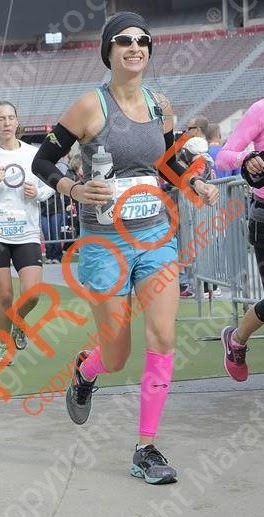 I knew I was in no shape to actually “race” my first marathon so I held back and focused on what I could do. I stayed true to my hydration/nutrition plan and it worked flawlessly- I didn’t even feel famished when I crossed the finish. Another thing that really paid off for me was the heart rate training- my average heart rate was 165 for the marathon, which is GREAT for what was technically race day. I peaked at 179 during my sprint to the finish but mostly stayed in the 160s. I was very pleased to see that. Honestly, I couldn’t have asked for a more perfect first marathon. And as everyone had warned it only took me a few hours to decide that yes, I will definitely be going back for more. I figure I can drag the marathon talk out for another two posts before I need to accept that it is over (sad!) and time to move on to future goals (exciting!). So today we’ll cover the day before and morning of the marathon. My anxiety was sky high on Saturday. I was so thankful that I had a really messy house to deal with and visitors arriving to distract me from freaking out. I let myself wake up without an alarm, as I assumed I wouldn’t be getting the best night’s sleep on Saturday I wanted to get at least a solid 8 hours on Friday, and that was pretty glorious. 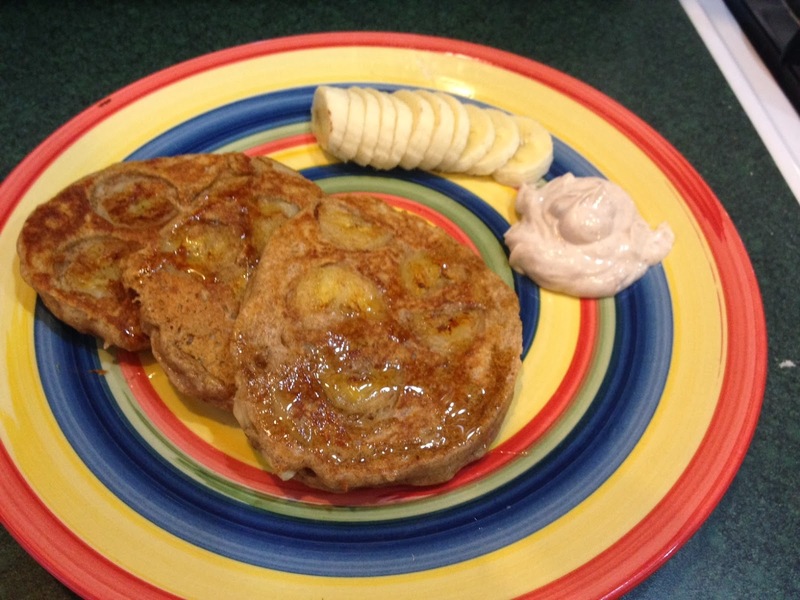 Another thing I wanted to do was enjoy a leisurely breakfast so I decided to try a new play on my oh-so-favorite Greek yogurt pancakes. I had 3/4 of a container of 0% plain Chobani in my fridge so I felt like the possibilities were endless! PB&Co. courtesy of a box of goodies I won from Chelsea of Chelsea’s Healthy Kitchen. So delicious! I dolloped my batter in the pan and added some extra banana slices while they cooked. 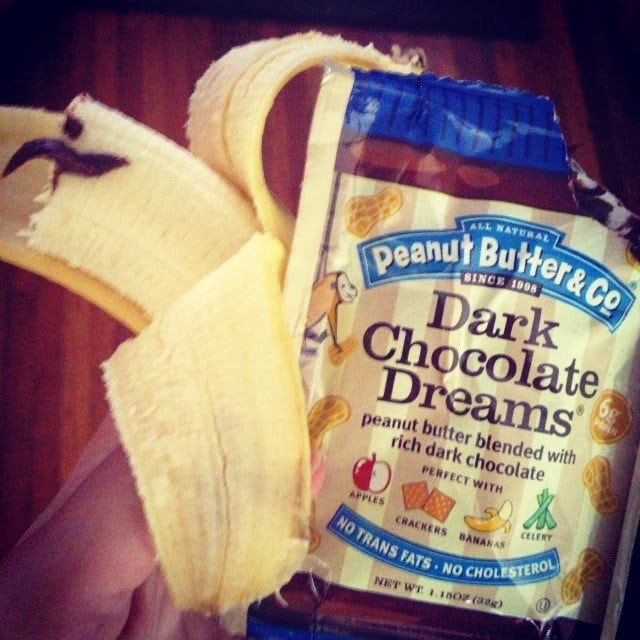 For my dipping sauce I mixed together the remaining Greek yogurt and a bit more of the dark chocolate dreams PB. I also sliced up the rest of the banana on the side. I’m glad I fit in my relaxing breakfast because as soon as I finished eating I was cleaning like a mad woman! I spent the next four hours doing laundry, vacuuming, scrubbing the bathtub, doing dishes, dusting, etc. before I knew it I only had ~20 minutes to shower and be ready for the arrival of my first visitor! Once my friend KT arrived (who was running her very first half marathon), we hit up the expo (which was super crowded and nothing to write home about) and the grocery store and came home to start making a big pasta dinner. My wonderful cousin and aunt had driven down to come cheer me on so they joined us and K. for dinner. I stuffed myself with pasta and then we all sat down to look at the course map, determine where they could see me and work on my playlist. By 10p I was in bed and I felt like a kid on Christmas eve! It was the perfect amount of clothes for the ~35 degree morning we were having! I loaded my pockets with a variety of fuel- I didn’t want to end up having my body reject one flavor of Shot Bloks (it’s been known to happen to me in race) and be left with nothing, so I took half a package of black cherry, half a package of fruit punch and half a package of pomegranate Honey Stinger energy chews. I put the remaining halves into another baggy for K. to have in case I wanted to grab them from him on the course. I filled up a water bottle with plain water, grabbed my Garmin + HRM, iPod and sunglasses and we headed out the door. I did it!! 26.2 miles of nothing but running. I’m going to need some serious rest and recovery time but I’m already working on my race recap (while the memories are still fresh) and can’t wait to share it! This week has been a blur of battling sickness and work, work, work. I’m trying to get ahead so I can happily enjoy having post-marathon Monday off to recuperate and it’s made for a pretty hectic week. Despite the busy-ness of work, I squeezed in a really nice run the other day. After reading basically every article about the marathon taper I could find on the internet (I like to do my research!) I felt like I had a pretty good plan in place, a few easy runs and then coasting until the big day. Many of the articles (sorry, no links because they are bookmarked on my other computer, but I know they were from Runner’s World) highlighted the fact that even though you are decreasing mileage you don’t need to decrease intensity (you also shouldn’t INCREASE it though, very important). As is typical for me during a training period, I’ve been feeling a little over running. I’m tired of watching my heart rate, of doing painfully slow long runs, of HAVING to run. So I decided to take a break from all that. I ditched the heart rate monitor, set my Garmin for 30 minutes and just RAN. It felt great! I remembered what it was to get my legs moving again, to feel free and happy on the roads. It was comforting to see that I hadn’t lost all my speed and that it could feel good again. I still have a shake out run or two left in me- 20 minutes today and maybe tomorrow, nothing hard- but I consider that to be my last “real” training run and it was the perfect one to end on. Last night I was craving comfort food to help shake this sickness so I settled on a chili recipe that I stumbled across not too long ago. I can’t remember what blogger had linked to this but as soon as I saw the name I knew I had to make it (and that my sister would want to as well): Peanut Butter Vegetarian Chili! I followed the recipe exactly and it was amazing! You can’t really taste the peanut butter but it does make the chili a bit more substantial- which can be hard with a vegetarian chili. 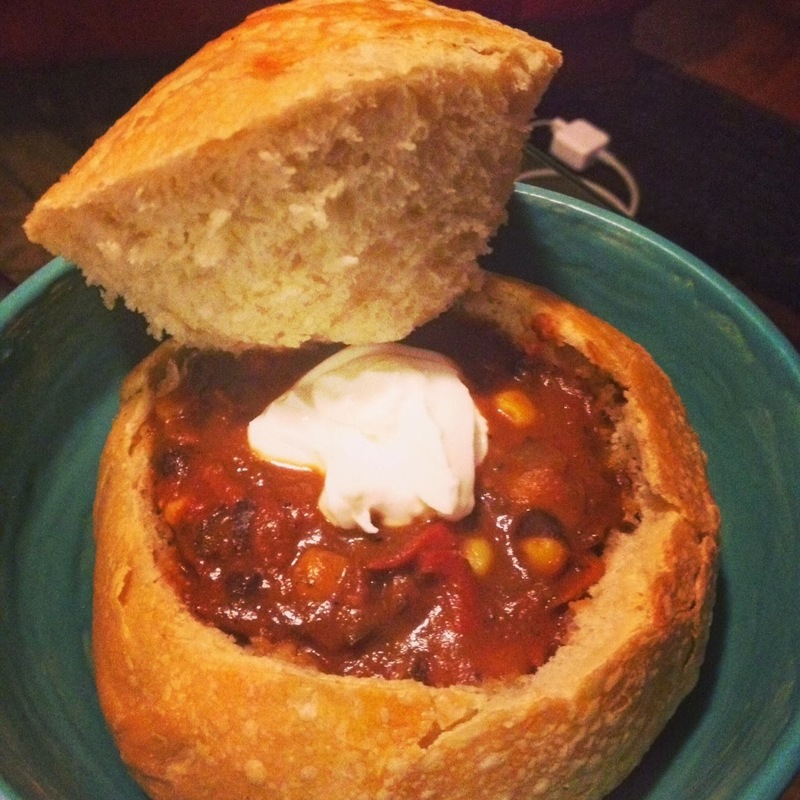 In the name of easing into carb loading I served mine in a sourdough bread bowl with a dollop of 0% plain Chobani. It was exactly what I was craving and we have tons of leftovers. We enjoyed our chili while watching half of the Eddie Izzard Marathon Man docu-series. Have you ever checked that out? It’s totally insane- with zero running background he set out to run 43 marathons in 51 days. And while he wasn’t setting any speed records it was still incredibly motivational. Really highlights the importance of mental toughness. It was super motivational. Big plans for tonight: playlist making (I want to have at least 5 hours of music ready), house cleaning (visitors arrive tomorrow!) and another good night of sleep (probably my last chance for that). I’ve been pretty open about the fact that I’m relatively terrified about this upcoming marathon. And while I’ve been trying to keep my nerves in check and do what’s best for me body, I feel like it’s all kind of coming to a head. Now that we are less than a week away from the big day I feel like the only thing I can think about is this race. It’s all consuming! In an attempt to temporarily clear my mind (and continue to properly fuel my body) I’ve finally been spending more time in the kitchen- and it’s felt good! 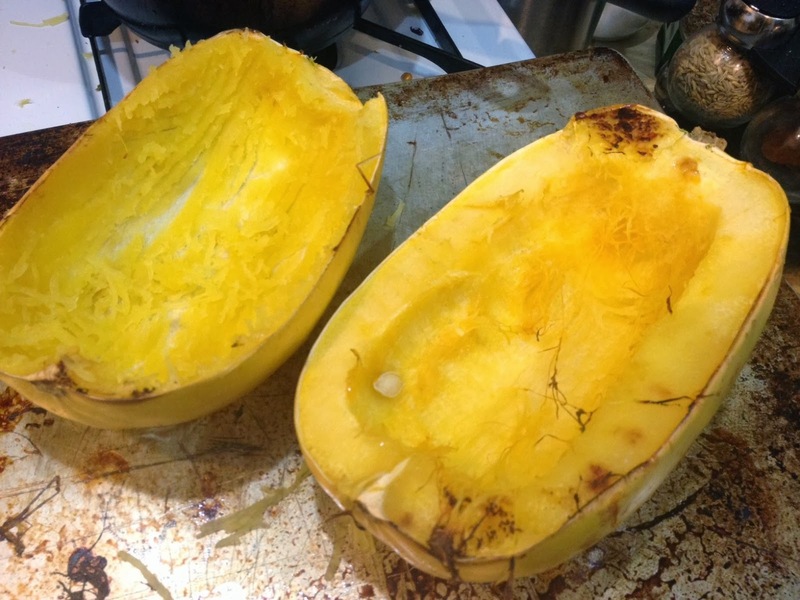 This weekend I decided to embrace fall and eat my first spaghetti squash of the season. I was craving vegetables but wanted a meal that also felt hardy. 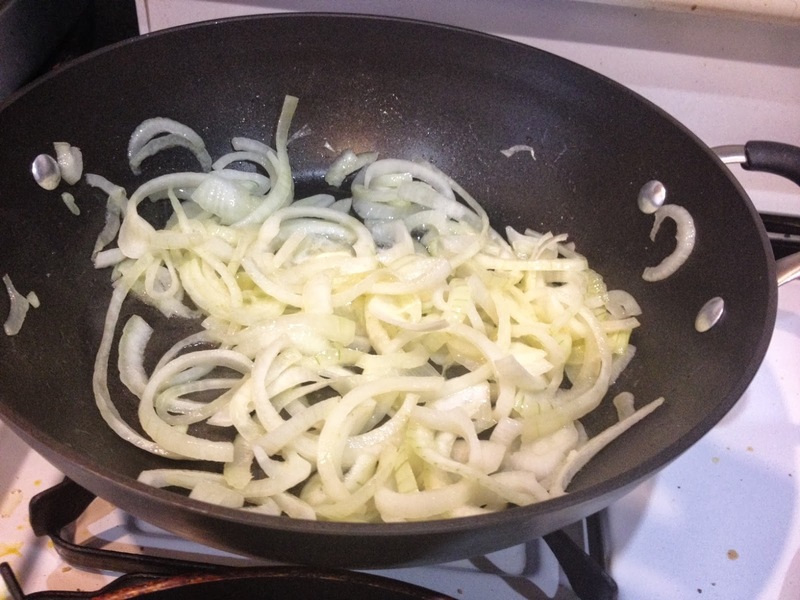 Like 99% of the meals I cook, I started by sauteeing an onion. 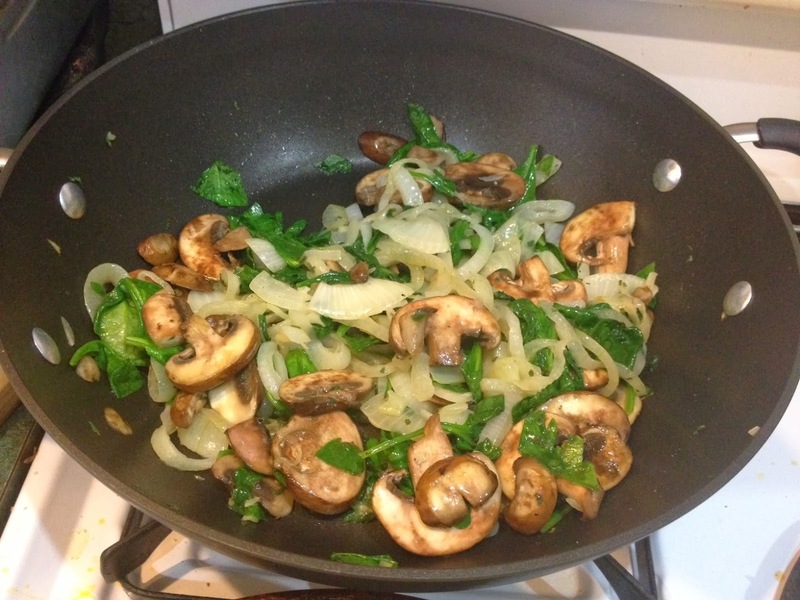 To increase the richness I threw in a tablespoon of butter, instead of using olive oil. 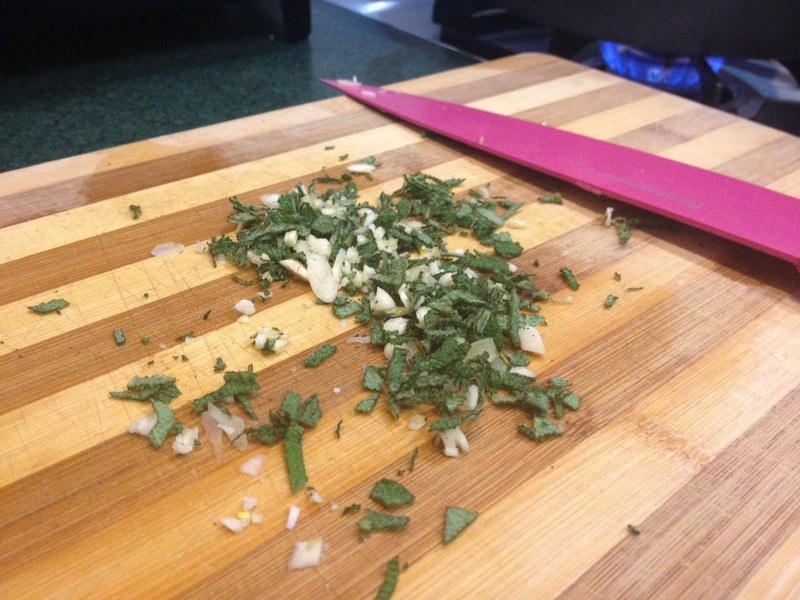 While the onion was cooking I chopped up some fresh sage and garlic. I feel that any autumn squash + sage = perfection. I added in the sage and garlic, a bit of fresh ground pepper, some baby bella mushrooms and probably 3 cups of fresh spinach (I love mt greens) and allowed it all to cook down. 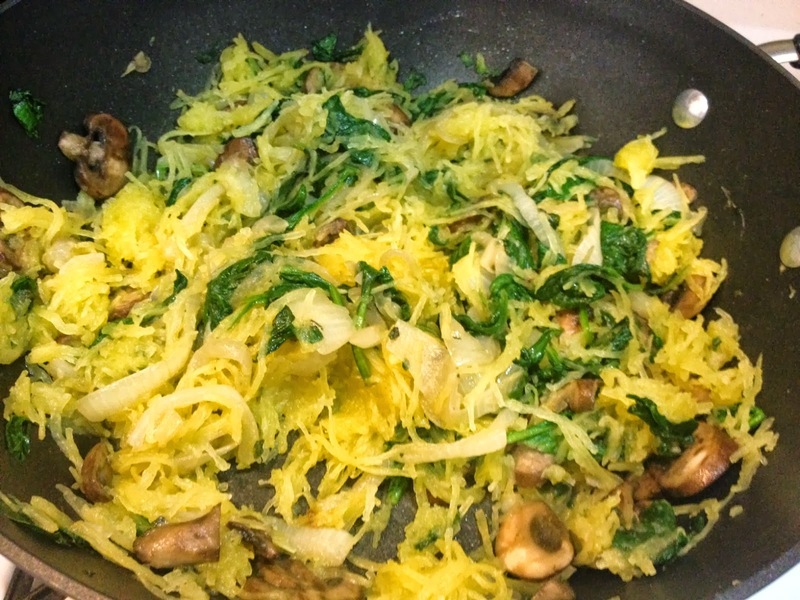 As all of this was taking place on the stove top, I had an entire (GIANT) spaghetti squash roasting in the oven. I generally just coat a baking sheet in olive oil, cut the squash in half and roast it face down until a butter knife can cut into it. This baby was over 5 lbs of deliciousness so I only shredded half and added it into the saute pan. 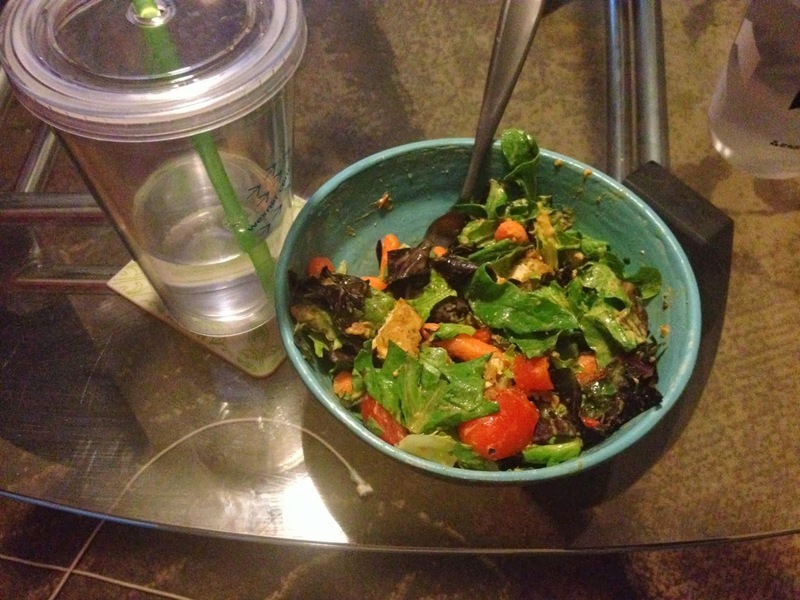 Finally I topped this all off with some of my sweet curry tofu and had a well balanced meal. This dinner tasted like fall and was extremely filling. I look forward to many more squash adventures this season! Not the best time to get sick.. or is it? I’m pretty sure that everyone in my general area has been fighting off the same bug, or at least that’s my scientific assumption based off all the data I’ve been gathering (i.e. reading whiny facebook statuses and watching my employees and co-workers drop like flies). Of course my instant reaction to anyone who mentioned being sick was to shoo them away and tell them that my precious pre-marathon body wanted nothing to do with their nasty sickness. I was feeling optimistic as I started the week with no signs of sickness and then the temperature dropped about 20 degrees and naturally all the little symptoms started showing up (and yes, I know that cold does not make people sick but drastic temperature changes ALWAYS make ME sick). So, I spent a day feeling run down and whiny and tried to go through my normal routine and of course I woke up the next day feeling 1000x worse. After a sick day, too many episodes of Gilmore Girls, two cans of soup and 13+ hours of sleep (thanks NyQuil) I was certain that I’d beat the bug and was ready for action. Yesterday I worked almost a whole day and attempted a 30 minute run, I thought “what can go wrong in 30 minutes?”. Well, that answer is a lot. About a mile in I felt tired so I slowed down a bit, which was practically a shuffle because I was already moving pretty slow, and sure enough my shuffling feet caught an uneven curb and WHAM before I even realized what was happening I was rolling into the middle of street. I got up, shocked, and noticed my bloody hand + elbow and honestly couldn’t help but laugh. Luckily I hadn’t seriously injured myself but obviously I was not in the state to be running. I was already half way into my out-and-back run so I just turned around and shuffled home (being sure to pick up my feet along the way). Once I got home I realized the burning sensation coming from my shoulder was due to a nice large section of road rash and that my hip was already bruising from my roll. Oh Ashley, you are too clumsy to do ANYTHING when you aren’t feeling 100%! Just like the three nights prior, I settled into the couch for a big bowl of soup and healthy serving of Netflix. 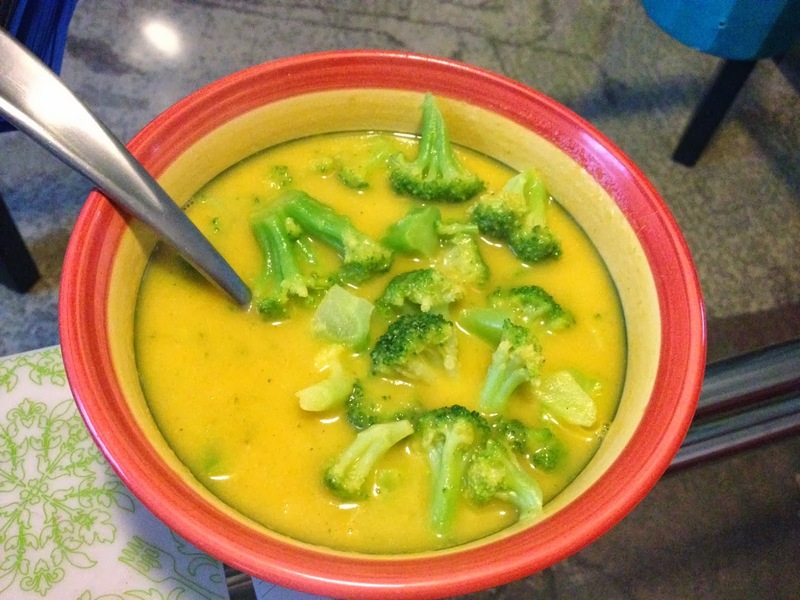 I realize now that looks like a big bowl of broccoli & cheese, which would be delicious, but it’s actually butternut squash soup (and TONS of broccoli). Today I do honestly feel better, which I am relieved to say, and hope that since I’ve already succumbed to the mystery illness of mid-Ohio that I can make it to race day with no further sickness. I may try to redeem myself with another nice & easy run tonight, preferably without the fall. Tomorrow is my last remotely “long” run (6 miles) and then it’s nothing but 30 minute jaunts from here on out. I’m getting excited/nervous/anxious/terrified/etc. and already beginning to obsess about every ache and pain I’m feeling. I’m also reading any marathon advice I can get my hands out- what to eat & drink throughout this week, how much exercise to do other than running (I hope to squeeze in some yoga and core work, but probably not much else) and I’m asking every runner I know for wise words. I can’t believe I’m into single digits on my countdown! So- weigh in! I love the advice I’ve received from you all so far and would appreciate more. What kind of things should I pay attention to this week? This weekend I tackled my last double digit run until the marathon and I’m so glad that it’s behind me! I know that people tend to complain about the taper but I’m welcoming it with open arms- I’m mostly looking at 30-45 minute runs and one six miler over the next two weeks and that sounds glorious right about now. Per the advice of all, I stuck to my training plan and set out for an easy 10-miler. I ate a pretty large-for-me pre-run breakfast (two pieces of whole wheat toast w/ PB + jam) so I could see how my stomach felt being a little fuller. To be honest I’m typically pretty lucky in that department- outside of the one stupid time that I ate hummus + popcorn pre-run, my stomach never gives me any issues. And Saturday was no exception to that, I felt well fueled. I normally wouldn’t take any fuel other than water for a 10 miler but I knew this would be my last real chance to toy with nutrition. I traded out my usual Shot Bloks for some pomegranate honey stingers just to see if I noticed a difference. For an early October day the weather was crazy hot. It was almost 80 degrees when I left my house and I was glad that there were some scattered showers coming my way. The run itself was pretty uneventful, I watched my heart rate closely and just tried to keep it super low. I ignored my pace (but I know it was SLOW) and just tried to enjoy my last long run. The next time I gear up and head out for long run it will be marathon morning! I felt good about fueling but still not so great about hydration, I think I need to work on drinking more on a daily basis so I’m at a better starting point (it also didn’t help that I had had a glass of wine the night before and not drank more water before bed, rookie mistake!). I needed this run to go well because my head has just been full of doubts. Thankfully I made it through all 10 miles pretty easily- no walking breaks, no mental breakdowns and only a few curse words (my heart rate monitor kind of went on the fritz and my patience was low). I’m well aware that being able to run 10 miles does not at all imply that I will breeze through a marathon but it feels better just reminding myself how far I’ve come. Now that I’m entering the homestretch I’m really trying to work on my mental toughness. Looking back at my May half marathon I know that those 5 seconds were due to giving up mentally, not physically. Obviously this race will be different, as I won’t be fighting for a certain time, but I do want to be fighting for a strong run. As much as I want to enjoy the ride and soak in every moment of it, I always want to push myself both physically and mentally (not to the point of injury though!). I don’t want to give up when it starts to get uncomfortable and start walking. One of my big goals was to run the whole race and I’d love to be able to accomplish that one- even if it’s a slow shuffle- I want to give it everything I’ve got. 13 days to toughen myself up a bit. K. has found some documentaries for me to watch and I’m re-reading a few of my favorite running books. Any suggestions for other things to watch/read?